"Superb intruments in every sense. No VST can compare to it. It sounds very, very refined but with a CPU load so light that you will need to check twice to believe"
If you are tired of the sound of electronic pipe organs, or you are looking for a simple to use realistic sounding classical organ for your MIDI compositions, live performances or practice, then look no further. Virtual Organ Company's VSTi plugins are what you need. We currently have a range of 5 organs, each suited for a different style of music or requirements. The plugins are extremely easy to use, either with your own VST host software, or as stand-alone instruments (no additional software neede). All you need is a midi keyboard*. All organs feature built in reverberation, transposer, a choice of temperaments and fine tuning. All functions are MIDI controllable too. "I still cannot believe how you were able to synthesize the church pipe organ sound without using samples. Thrilled!!!!!" Because our organs do not use samples, but each voice is created using sophisticated digital additive and subtractive synthesis, the modules are relatively small (typically only around 2Mb), and are therefore really quick to load and immediately ready for use. 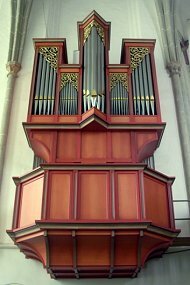 Despite this, they do sound extremely realistic and are therefore ideally suited for any application that needs a real organ, including recordings and live performances. Not convinced? Have a listen to this: Part 5 of "a Requiem in 12 parts (©2009 Nico Hovius) and hear for your self. Check out some more samples or download our freeware or demo organs to try. All our VST organs are extremely affordable, much cheaper than any other comparible virtual organ software, and are for sale on this site in our online shop. We do a special offer on collections of 3 and 4 organs. We take PayPal and credit card payments. *We recommend using an ASIO compatible soundcard for use with our instruments in order to keep latency to a minimum. Our VST plugins are currently only compatible with Windows. In order to make sure our VST plug-ins are compatible with your system, we recommend downloading our Portatief I to try or the demo versions of some of our other modules before you decide to buy. Please feel also free to contact us with any questions you may have. If you like the sounds of real organs, perhaps you also like the sound or real bagpipes. Have a look at ePipes where you can find midi compatible bagpipes and more.